Check the stats! Check the stats! This is always the thought in my head whenever I open up my laptop and hop onto the account of one of my favorite Internet hobby sites. There is usually a strong resistance to actually do that at first, the fear of being underwhelmed or disappointed coming about, but then the pressure and nagging gets to surmounting so high, the curiosity at a peak, that I must see what has happened since my last update. The reason for my initial fear of checking my stats everyday is because I’m afraid of being met with either bad results for the day or no change at all. The worst feeling I think I get is the fear of there being absolute silence in my feed, getting ignored completely. This greatly applies to my Twitter where I usually get no retweets or favorites on my tweets, even if I thought I put out a rather humorous and pun filled tweet – but in the world of high stakes social media, you have to think very differently to capture people’s attention. It’s not just about thinking outside the box, it’s about reimagining the box. Is that clever? I don’t know. I don’t always check the stats on this blog, preferring to not be overwhelmed (or disappointed) by the numbers and pressure to conform to a set standard. Sure, the numbers are a great help in assisting me on my journey through the blogging cosmos, knowing how to avoid the asteroids that deter my path to success and catch a gravitational pull that has me sailing along, but sometimes I like to create posts on my own merit. It’s a lot more exciting to think of ideas that you have no idea will work, just to have some creative experimenting. I usually go two or three days, maybe even more, without clicking the bell icon in the corner of the screen. I’m usually afraid to click it, afraid to find out how recent posts of mine did. I want that nervous feeling to die down before I actually update myself. Sometimes the icon is clicked by itself, caused by a glitch in my browser when I type on the keys in the visual editor (the HTML tab works fine), to my annoyance but relief that’s it’s over. I probably should check out the main stats page of my blog every day and check my notifications to stay on track and get inspiration, but I feel like I don’t have to, like it’s not necessary to always have a numbers guide for me to operate. But when I don’t do it, I feel like I’m not using all of the tools available to make me a great blogger, as if I’m crippling myself by cutting corners. So the real moral of this post is that you have to use all the available tools given to you to ensure success, instead of just relying on guesswork. That’s why there are Stats pages, Analytics, and other things to help you be the best that you can be. Don’t avoid them if you can, because you’ll only be hurting yourself. Success on social media, including blogs, is tied a lot to what people really care about, and that is reflected in the stats that are collected on almost everything. The numbers do not lie. Listen to them. Tell us about something you should do…but don’t. Oh, boy, how social media has changed the game for the entire Internet and me. It’s Facebook, Twitter, Instagram, Google +, YouTube, and even WordPress where I’ve come to realize the online world is a HUGE place. And the people with the giant fan bases will exceed and prosper while the little ones will always trudge behind and have to dream of someday becoming an Internet “celebrity”. It’s wild frontier out there and you have to work hard to succeed these days – usually. And with social media comes great jealousy – the reliance on likes and followers, for instance, greatly set the most popular apart from the rest. And it’s funny because before 2010, when I first got on Facebook, I didn’t even care. I think my green-eyed lady stems mostly from the Internet, seeing people who are enormously popular and seem to be on an entirely different planet than me. No matter how hard I’ve tried, I have just never seemed to get the hang of YouTube and that’s mainly because I’m competing against highly established channels that bring in millions of views per video on upload day, are worshipped like gods in the comment sections of other videos and are mentioned on other sites, and because I’ve never been very dedicated to succeeding on there anyway. And not only has pangs of jealousy come from YouTube personalities like Tyler Oakley and Jenna Marbles, now it comes from these personalities getting to come on network TV (Oakley appeared on The Talk on CBS, Jenna Marbles was mentioned on CSI, and iJustine, another famous YouTuber, will appear on The Price Is Right), and also being mentioned on the radio and the thought that comes to my head is, “Wow, these guys must be really famous.” – which ultimately degrades my well-being. Seeing people on Facebook that I knew from school get tons of likes on their posts also bugs me, because I’m lucky enough to get one or two, all from my family members. It’s also the friend counts. A couple of my high school mates have over 1,000 friends and growing while I’ve been hovering around 290 for a while now (about 30 of those “friends” are fake accounts set up by my family for games, so the total is a lot lower), and I try not to feel that envy when I see the totals but it immediately puts me on a much lower pedestal. It also doesn’t help when I hear that some of my “friends” are living much more exciting lives than I (going to different countries, attending high-profile colleges, getting to know lots of people), while I just sit on the sidelines at home and watch. One of my friends, his first name Joshua, one day posted that he was visiting Taipei and also was going to attend college there. The results of that post? Over 100 likes and comments. And I tried to feel great for him but a surge of the green-eyed monster outweighed this, and I added another “like” to the boiling pot even though there’s likely no reciprocation by doing so. With Twitter, it’s a little bit different for me. I don’t tend to have much jealously, except, of course from people I hate such as Justin Bieber and seeing their annoyingly narcissistic tweets. I don’t let the high follower counts and retweet numbers of celebrities get to me because that is mainly what you’d expect. It’s just when I fail to get any retweets or favorites on my individual tweets, some of them I thought were witty and humorous, and others seem to have a lot more success. But hey, it’s all a numbers game in the end, isn’t it? I don’t get on Instagram at all (not since 2012), so there’s really no reason for envy there. With WordPress, I’ve come to realize this is a learning process and you can’t expect to succeed overnight. There are a number of bloggers I know out there that have over 4,000 followers and get like counts ranging from 60 to 200, and yes, there does come some jealousy, but I quickly face the facts that these bloggers have obviously been at this for a while and have honed their craft, leading to their surge of popularity. Seeing exceptional, Freshly Pressed worthy writing and the most beautiful pictures from bloggers also puts my work into perspective and I realize I could never copy them no matter how hard I tried. With blogging, it’s better to be authentic than try to live a life that’s not you. The Internet can be an evil place sometimes. 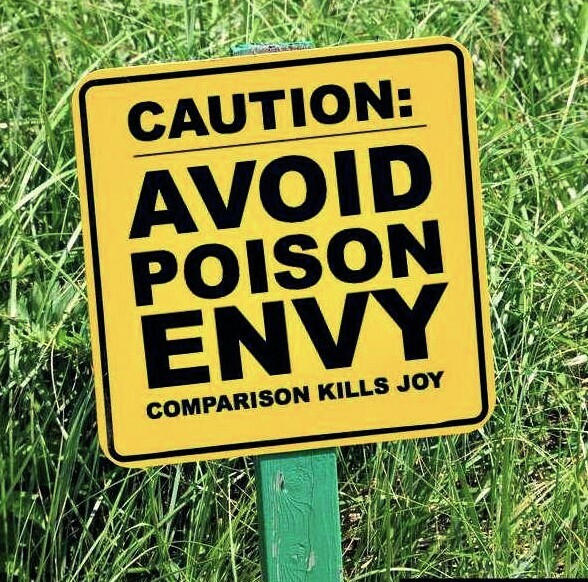 Don’t let the jealousy get to you because it can consume you to the point where you will stop at nothing to reach the pinnacle of recognition and respect. It’s happened to me a number of times – and about half of those followers I paid for on Twitter have since disappeared thanks to Twitter’s great purging system of inactive robot accounts. I’ll never fall for that scam again. It’s no use trying to conquer the Internet. Just be yourself and have fun; if you feel like it’s getting to you go outside and get some fresh air and remember that the Internet is just an invisible layer that can be shut off at anytime you want. My life is on the Internet. For the last 10 years or so it has been. The sudden rise of the social media era (circa 2002) and all of these websites that basically act as stop and go community hubs along an interstate highway has made me realize you can’t feel alone anymore on the web, not like when I first discovered it one sunny day in about 1998, when Google was still just a search engine and nothing more. We are closer to one another than ever before behind these machines and other devices of ours. The Internet (or internet) is bigger and more accessible now than it was ten years ago (does anyone still use dial-up?) Our lives on social media seek approval from the number of followers, likes, comments, views, re-tweets, and other statistical things that are basically the currency of the Internet (other than those bit-coins that someday might actually gain trust in using). Not that those things actually are of a big importance to me though but it still makes me feel good whenever I get likes on my content or someone enjoys it so much that they would feel free to follow or subscribe to me (something that is taken for granted by some of the larger players out there). I feel like I’ve had moderate success on the Internet. I might not be the most popular person on the interwebs or have the most followers on Twitter, friends on Facebook, or subscribers on YouTube but I am apart of this huge playground and have contributed to it in a small, if not effective way. I’ve posted content, chatted it up with the popular, up and coming, and outcast crowds, and put my two cents in on various topics and discussions (talking about you, 2014 Ferguson). Wow. A surge of nostalgia races through me whenever I think back to when the Internet felt like such a small and unfamiliar thing as in this video. My mind has been opened to so many new and exciting things with my presence online. I want to be better at the Internet. I want to connect with more people and have them see my work and give me feedback, rather than it being lost and never to be read – if it’s a blog post – or viewed – if it’s a video. My voice needs to heard. Being just a face in this virtual crowd is not an option anymore. I want to be found, to be recognized, to have the satisfaction that what I’ve done online actually means something, has replay value so to say and can be great enough for someone to go back and view again. Which brings me to what I love to do the most: making videos, YouTube videos in this case. I love blogging as well but that’s pretty self explanatory. This past year I’ve really been going at it hard with my YouTube channel and making it look like something that is actually worth people’s time investing in. I’ve made significant progress this year, even if the subscriber count doesn’t say so, and have updated and gotten rid of videos that I wasn’t exactly proud of. I have scaled up my production value quite a bit, keeping within my budget of course. There is so much this year (and the end of last year) that I have learned that has made me go back and look at my previous work and think “Man, I could do so much better.” I shake my head at the things I could have done in the past, the things I missed since I was so new and inexperienced with video making. Becoming successful on YouTube has never been a realistic dream of mine, since it is mighty tough these days, competing with content on the levels of a Hollywood movie production (many of those channels are actually run by or working with Hollywood talent now), and YouTubers with large followings of course, and so right now it’s a passionate hobby of mine. Sure, you can make money, big vaults of money, but only a handful actually make enough to pay their monthly rent and nothing more. No, I’m not in the YouTube business for money either, though it would be nice if this little venture of mine suddenly became lucratively successful, but as of now I’m still a little man with a computer, video camera, and humor that people may or may not find funny. I love making videos, want to continue making videos, have fun in the process, get new and better ideas. Having all of the work and effort being translated into thousands of views and subscribers hasn’t happened yet, at least not for the good reasons – which is partly because of my ignorance and not paying attention to detail. Keeping an audience (whoever that may be) engaged for at least two minutes of one of my videos is my goal for the future. I have to have people think, “Hey, I kind of dig what this guy is doing,” and later on say, “I want to see more!,”rather than “Ugh! Forget this. I’m outta here,” which, based on my latest stats, has been the case. But practice makes perfect. Rome wasn’t built in a day and so shouldn’t a great YouTube channel. By the way, if you’re interested you can check out my channel here. I go by the name “Matthew Lombardi” on there, but that’s not my real name. I’ve recently gotten into doing “Let’s Play” videos, quite a popular but congested genre with the YT community and hope to continue to expand and make this something that defines my channel. Are you good at what you do? What would you like to be better at?